Sit on the cable machine. Secure your legs under the thigh pad. Grasp the rope with a neutral grip (palms facing each other). Your arms and shoulders should be fully extended upward. Keeping your elbows close to your body, exhale as you pull the rope down until your elbows move behind you. Stick out your chest, squeeze your back muscles, and hold for a count of two. Inhale as you return the rope to the starting position, with your arms and shoulders fully extended upward. Keep your core tight and your body still. Only your arms should move. Do not lean backward. Pull the rope down vertically. Pull the rope with your elbows, not with your biceps. If the rope is too long, kneel or sit on the floor. Few people use the rope for lat pull-downs. It’s good to use different attachments sometimes, such as the rope, because different fibers are activated, which keeps your muscles challenged. 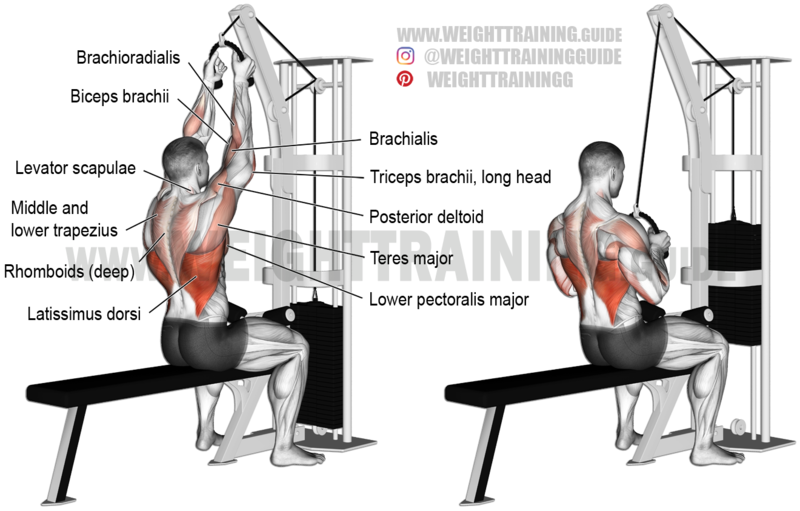 Do not confused the rope lat pull-down with the triceps rope push-down. See also the medium-grip lat pull-down. I use the rope and bar. I mix it up. I think the rope adds more thickness to the back while the bar adds more width. Might be wrong.